We're bringing the Hoosier Beer Geek 6 Pack back! The 6 pack is a feature where we run six questions by the folks behind the scenes at breweries, brewpubs, distributors, liquor stores, and bars to get a little more insight into what they do, what they like, and how they got their start. Big Woods Brewing Company, a wildly successful brewpub, opened in 2009 in the heart of Nashville, Indiana. Because of the overwhelming response to their craft beer, they launched Quaff ON! Brewing Company in 2012 to keep up with the high demand. Now, just two years later, Quaff ON! is distributing throughout the entire state of Indiana. Find out from their Head Brewer, Mark Havens, what makes their beer so damn "Quaffworthy". 1. What type of changes have you implemented since coming on board at Quaff On!? Since Quaff ON never existed… I helped build Quaff ON from the ground up. Once I arrived in Nashville, I let go of 3 brewers, trained one and hired in another. I've adjusted hop usage, malt bill, water profiles, and yeast dosing/handling/propagating rates. Quaff ON is brewing some of the Big Woods Beers as a production facility. With each batch brewed, these beers are getting better and becoming more consistent. We still have room to improve though. It has been really great to have two breweries because we can run test batches at Big Woods and get quick customer feedback before we decide to run a beer for distribution at Quaff ON. 2. For readers that didn't follow the name change, can you provide a little background on it? There are actually a few Big Woods Brewing Company's around the Mid-West. The largest is in Minnesota. Big Woods in Nashville, Indiana wants to distribute regionally at some point in time. Trying to distribute into other states would be difficult using the Big Woods name. 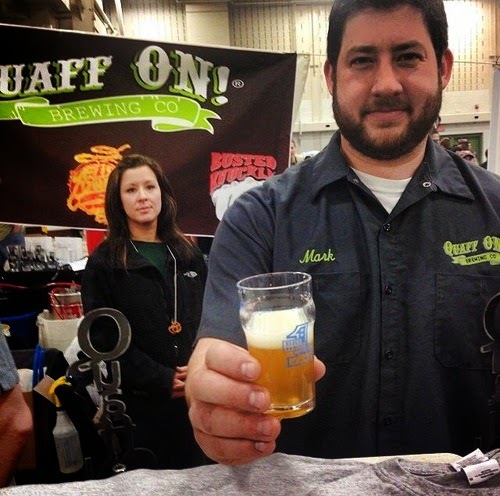 Ownership decided to use Big Woods Brewing Company's tag line "Quaff ON!" as the name of the new production facility and brewery that will move forward with both in-state and out-of-state distribution. 3. Talk about brewing in Nashville. What is like to brew in a destination city, and would you consider the brewery more locally focused, or is it trying to be a destination brewery? Brewing in Nashville is fun. I've met a lot of new people. Downtown Nashville is bustling with tourism during the spring, summer, and fall, making it an awesome place to shop and drink craft beer. During the Winter months it may slow down a little in Nashville but that is the time when all the locals come out and it has been great meeting new people. Quaff ON is approximately 1 mile north of historic downtown Nashville. I don't get a chance to get out of the production brewery much, but when I do, its usually visiting accounts, bars, and distributors. People are going to visit Nashville no matter what. We are trying to make Nashville the Disney World of craft beer. We want people to know we have great beer, fun beer-related activities (tours of Big Woods and Quaff ON) beer sampling, beer dinners, etc. The locals support our cause. Big Woods will continue to focus locally, while Quaff ON will try to establish ourselves as a destination location. 4. How does your creative process work for new beers? Any beers you can talk about that turned out much better than you thought or any duds that have a funny story associated with them? The ownership here trusts my judgment with new beers. I have an amazing pilot brew system in place too. Big Woods has a 4-bbl brew house and a good friend of mine, Martin Gradolf, brews there. Martin is just as crazy about beer and trying new things as I am. We're both hop heads. I'll come up with a brew and Martin will execute it. The locals get first crack at it, but ownership gets to weigh in on what they think. Quaff-worthy brews head up north to Quaff ON to be brewed on the 15-bbl system. During the process, we have our team focus on artwork, label approval, and distribution so new brews can hit the shelves ASAP. Bourbon Busted is amazing. We're trying for a nice soft Porter aged in barrels instead of the typical motor oil type beers aged in barrels, which is currently popular in the beer industry. Bourbon Busted has a nice bourbon flavor with a soft wood character. More of an everyday drinking barrel aged beer. Sadie the Goat is a brown ale we've been working on. We've tried an over the top single hopped version and a more middle of the road nutty/malty version. This is a great beer either way, but as to which direction we will go… the jury is still out. Hoosier Red is another beer we're working on for the IU basketball season. Nice ruby red with soft hopping rates. Our Double IPA, Crosshare, should be rolling out in the spring sometime and we are very excited about it. No flops yet. 5. Is the plan to keep bottling in bombers only? Currently we have stopped bottling in bombers. We have every intention of getting seasonals into bombers and firing up the bomber bottling machine, but for now we are going to focus on our Core 3 beers in 12oz. bottles. I purchased a new bottling line in November and we are bottling 12oz. bottles with ceramic printed artwork. The bottles look really sharp. Yellow Dwarf, Hare Trigger, and Busted Knuckle are the Core 3. 6. What should be know about Quaff ON!? 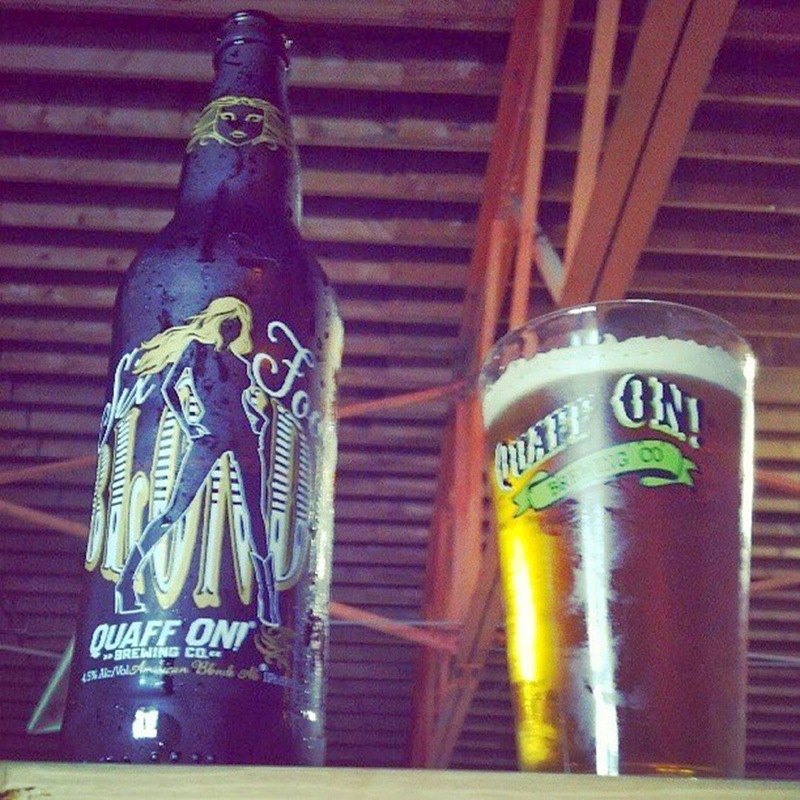 The most important thing for people to understand about Quaff ON is that we focus on making “Quaffworthy” beer. For a beer to be “Quaffworthy” it needs to high quality, interesting and flavorful, and most importantly it needs to be able to be enjoyed by a wide audience. We want everyone to try our beer, from the craft beer novice to the most seasoned beer geeks. That doesn’t mean that we shy away from making certain styles but it does require us to put a great deal of market research into brews. A lot of different people come to our pub in downtown Nashville and we try to get as many opinions of our beer as possible. If something isn’t right…we are not afraid to change it. If you'd like to participate in a 6 pack interview, it's as easy as shooting us an email with the subject line "6 Pack Interview."